Artist Janet Davidson-Hues (’66, P ’95, ’00) of Lawrence, Kansas, patched together her own education in art and language during her time at Wake Forest. Her journey to find her voice, she says, has been long and difficult, but the paintings she has created on her nontraditional path incorporate wordplay and have given voice to other women along the way. As an only child, Davidson-Hues was an introvert who loved reading, writing, printing and drawing. Her mother had been an English major, so Davidson-Hues said it was almost a given she would follow in her footsteps. She did — and more. When Davidson-Hues, then Janet Gross, was at Wake Forest, there was no art department. She took every art history survey course she could and drove to Salem College to attend studio art classes. She became an English major and an unofficial art minor, using every opportunity in Winston-Salem to explore a counterpart of language: image. In her senior year she participated in the second University art-buying trip to New York City for students and faculty. The goal was to learn about art and buy pieces for the Student Union Collection of Contemporary Art. 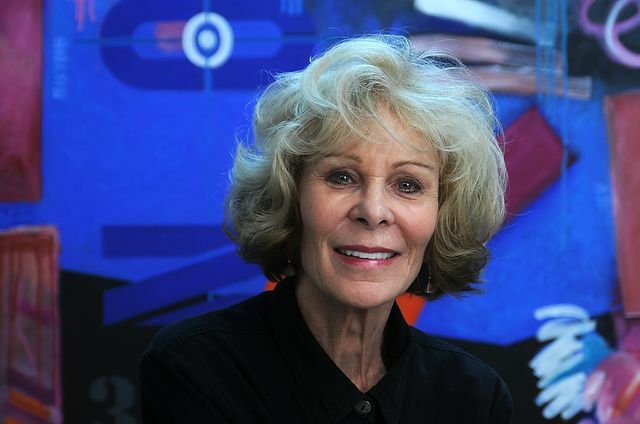 She remembers the thrill of touring galleries, speaking with dealers and learning the ins and outs of purchasing art. She also remembers a particular professor who accompanied the group on the 1966 trip, the professor she credits with imprinting her love for language — Provost Emeritus Ed Wilson (’43). “I wouldn’t miss one of his classes for anything because he was such a fabulous teacher, and the poetry would just sing when we’d listen to him read it,” Davidson-Hues says about Wilson’s Romantic Poets class. “She was a brilliant student with a great deal of promise,” Wilson says of Davidson-Hues. After graduation she pursued a career in advertising, working for Hallmark in Kansas City. But her encounters with the works of artists Barbara Kruger and Jenny Holzer, who use primarily text in their images, inspired her to take a new path. She decided to combine her love for art and language. With a new direction, Davidson-Hues got a master’s degree in art and education from Columbia University and her master’s of fine arts degree from the University of Kansas. She taught art at Indiana University for three years and today is a full-time artist. Davidson-Hues’ paintings use text that has implications for the female experience. She makes lists of terms and examines the peculiarities of language, analyzing and picking apart all of the modes of its interpretation. She has worked with sound, performance and multimedia but now sticks strictly to paint. “Mother and I” is one of her pieces on display at the Flomenhaft Gallery in New York City. 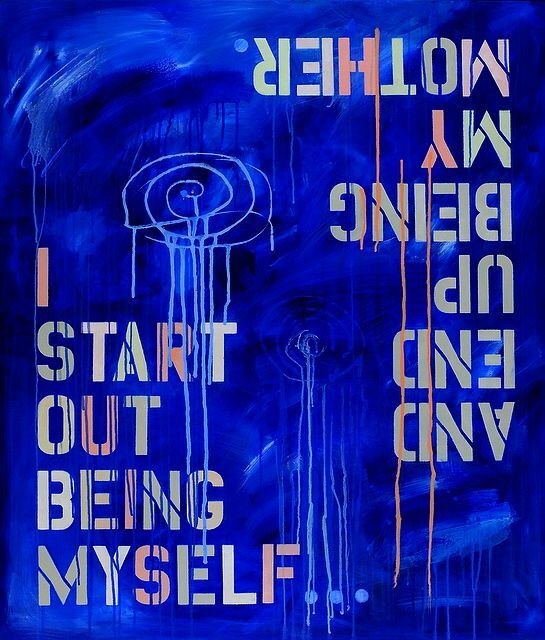 A medium-sized canvas with a bright cerulean background, the drips and swirls of paint create an organic backdrop to the bold, stenciled phrase laid overtop: I start out being myself … and end up being my mother. “She captures your imagination, making you look and think twice,” according to Flomenhaft Gallery’s description of her work. Davidson-Hues says she tries to pair the literalness of a quote with the painterly quality of the backdrop and reduce it to a sentence and a background. Despite the deceivingly simple aesthetic, Davidson-Hues’ work continues to move her viewers.